Ever wonder how those people get those trophies with catapults on them? The answer is simple. SNOW WARS! 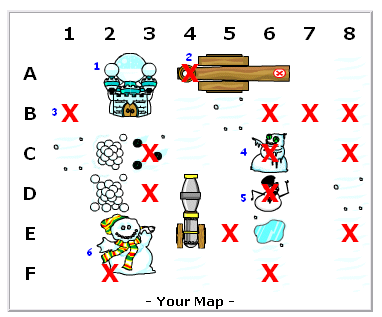 Snow Wars is a non-flash game in which you fire snowballs at your opponent's objects on their side of the field. The catch is, you cannot see where they are, so you will have to guess. But there are some strategies out there that can make Snow Wars an easy game. If you haven't noticed yet, Snow Wars is very similar to Battleships. Each game costs 100 NP to play, and the prizes aren't really worth it... but you get a trophy! This is a list of all objects and weapons in Snow Wars. These are small snowmen. They take up only one space and are the hardest to find. This is a catapult. This will be horizontal only. This takes up three spaces. These are the largest items. They take up four spaces in a square form. These are the largest, and the easiest to find. The snowballs and the cannon are both vertical. They take up two spaces. This is your castle; one of the two objects that take up four spaces. This is a blank space. This is a snowman. Snowmen are the hardest to find because they take up only one square. This is another one of those hard to find snowmen. This is your catapult. If it gets hit all three times, you will still be able to fire snowballs. This is your large snowman. This is another object that takes up four spaces. even if your catapult or piles of snowballs get hit, you will still be able to fire. 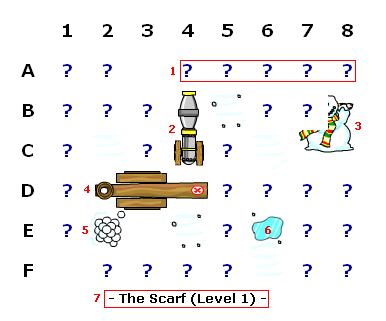 These "Question Marks" are the locations on your opponent's map that you have not yet thrown a snowball at. Once you click it, you will throw a snowball at that location. Next turn, the question mark will not be there, instead, whatever was underneath it will be. This is an object that you completely destroyed. This is an object that you have partially destroyed. This is another object that you have completely destroyed. This is a partially destroyed object. This is scenery. This has no effect on the game. This states who your opponent is, and what level of the game you are currently on. Yes. There are tips and tricks to Snow Wars. When you click a question mark, most likely you can click another, or even a whole row at a time. Yes, you can do this. The strategy is simple. Click all squares in a diagonal pattern. (Red or Green). Then simply click on the other parts of your opponent's army. 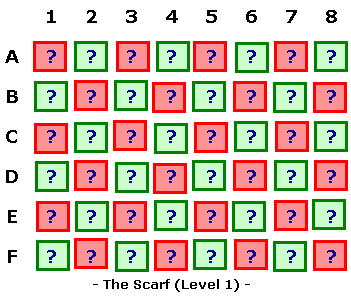 If you clicked all green the first time, then click all the red squares, or vice versa. The snowmen are a bit different. Since they only take up one square, you will have to manually find them. This is a list of all the opponents and rewards. You can win trophies and battledome items from Snow Wars! Well, I hope this guide helps all you Snow Wars fans. Good luck launching those snowballs!